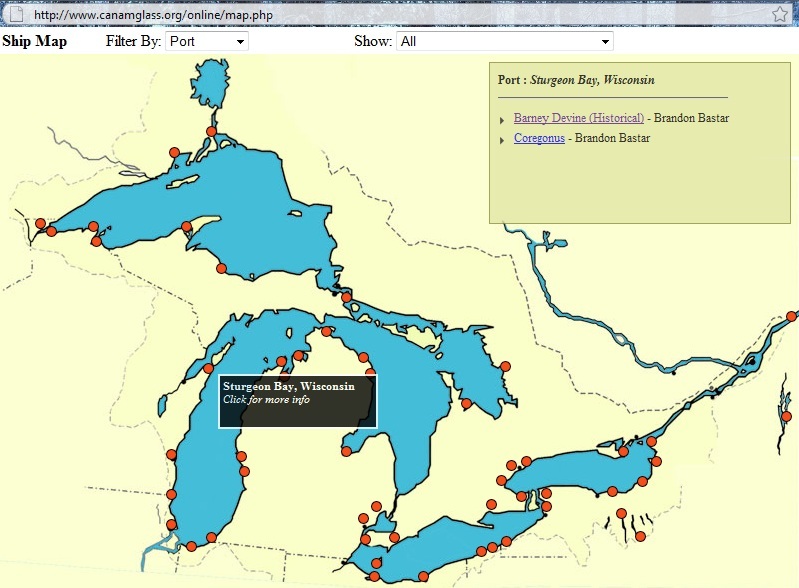 Track research vessel locations on the Great Lakes and learn more about them through the Great Lakes Association of Science Ship's ship locator. Ninety-four thousand square miles of Great Lakes water are these vessels’ playground. But this isn’t a game of Battleship. The Great Lakes Association of Science Ships provides an easy way to find the more than 100 U.S. and Canadian vessels that research and monitor the Great Lakes each year. The association’s ship locator displays where the vessels are at. Filter by schedule and click on the ship icon in northern Lake Superior to see ships visiting this year–the U.S. Geological Survey’s Kiyi research boat will be there in June. You can also see ships investigating Finger Lakes, Lake Champlain, the St. Lawrence River and St. Mary’s River. Narrow your search to see by month which ships are navigating that region at that time. Filter by port to find where the vessels call home. The U.S. Environmental Protection Agency’s Mudpuppy sits in Bay City, Mich. on Lake Huron. Click on the ship link on any search to link to its profile. You can learn about the ship’s navigation equipment, on-board labs, speed, captain, history and other characteristics. You can also find information on historical research vessels–the Barney Devine was the Great Lakes oldest research vessel before being replaced by the Wisconsin Department of Natural Resources new ship, the Coregonus. Access a list of all the Great Lakes research vessels under the site’s ship listing. Vessels are owned by state natural resource departments, the National Oceanic and Atmospheric Administration, Sea Grant offices, the U.S. Geological Survey, the U.S. Fish and Wildlife Service and other conservation or scientific organizations. But beware–some ship operators update their research schedules. Others don’t, said Council of Great Lakes Research Managers secretary Mark Burrows. Burrows said the International Joint Commission, which manages the site, encourages updates but there is no guarantee. The map was created to help researchers collaborate on missions. Contact information to make such an arrangement can be found on the ship’s profile under Institution & Contact Info.